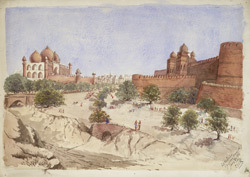 The walls of the impressive fort at Agra are 20 feet high and dominate a bend in the River Yamuna. Initially a military establishment constructed by Akbar between 1565 and 1573, the site became the capital of the Mughal Empire and continued to be developed by the emperor's descendants. Shah Jahan, Akbar's grandson, constructed most of the principal buildings while Aurangzeb, the last great Mughal emperor, was responsible for the ramparts. The Jami Masjid or congregational mosque (1644-58) was built by Shah Jahan and named after Jahanara, his favourite eldest daughter, who was imprisoned with him by Aurangzeb. It stands on a natural outcrop of rock which dominates the city and took 5,000 workmen six years to build. The eastern gateway was opened only for the emperor and later for the Governor-General.